One of my go-to recipes is chili. It's such a hardy, versatile meal. Plus you just throw everything together in a big pot. Relatively little energy goes into this dish, and sometimes that's really all I can manage to whip up... something I can just dump into a pot. 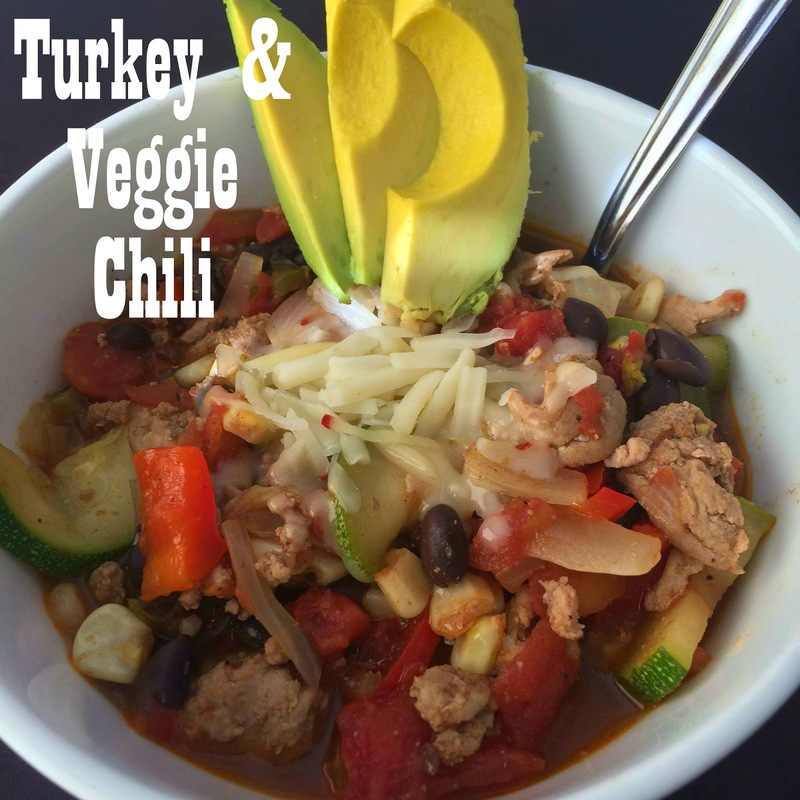 Using lean turkey and a bunch of veggies yields a pretty darn healthy meal too. Sometimes I make a typical chili with tomato sauce and beans, but I like to try to get in as many veggies as I can. So I guess this recipe takes a little more work than dumping in cans of beans and tomatoes. You technically have to chop up some veggies, but I mean come on. It's still easy. You can really alter it to fit your taste. Don't like zucchinis? Leave'em out. Want more veggies? Chop'em up and throw'em in. But the basic ingredients are the turkey, canned Rotel or diced tomatoes, onion, chicken/veggie broth, and seasoning. Everything else is pretty customizable. Heat 1 teaspoon of oil or cooking spray in a skillet over medium heat and cook turkey until evenly brown and set aside (or cook the turkey in your large pot just before the onions, for a one pot recipe!). While they turkey is cooking, add a teaspoon of oil or cooking spray to a large pot and cook onions until tender, about 3-5 minutes. Stir zucchini and peppers into the pot and cook 2-3 minutes. Once turkey is cooked add it to the pot, followed by the broth or water, tomatoes, black beans, zucchinis, bell peppers, corn, and seasoning. Stir everything together and bring to a boil. Reduce heat to medium-low, cover, and cook 30 minutes. Chili will thicken as it cools. Top with garnish of choice, serve warm and enjoy! Refrigerate any leftovers. Portion it in containers for quick grab-n-go lunches! If you are a Chili fan, you MUST try this. The flavors and spice are PERFECT (well, i added a little more spice because I LOVE spicy, but the original flavor is amazing.) I sort of cheated with this recipe and used a crock-pot because I wanted to go to the beach and didn't have time to sit and cook. I threw everything in the crock-pot, went to the beach and 4 hours later, I had this mouth watering Chili waiting for me.